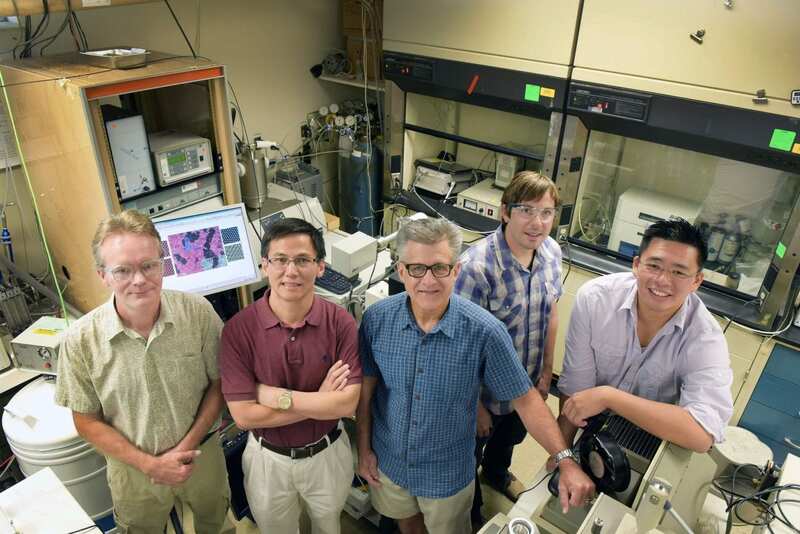 Sandia National Laboratories researchers seeking to make hydrogen a less expensive fuel for cars have upgraded a catalyst nearly as cheap as dirt — molybdenum disulfide, “molly” for short — to stand in for platinum, a rare element with the moonlike price of $1,500 a gram. Sandia-induced changes elevate the plentiful, 37-cents-a-gram molly from being a welterweight outsider in the energy-catalyst field — put crudely, a lazy bum that never amounted to much — to a possible contender with the heavyweight champ. The improved catalyst, expected to be the subject of an Oct. 7 Nature Communications paper, has already released four times the amount of hydrogen ever produced by molly from water. To Sandia postdoctoral fellow and lead author Stan Chou, this is just the beginning: “We should get far more output as we learn to better integrate molly with, for example, fuel-cell systems,” he said. in what sense were the parts “dead,” one might ask? Visualize an orange slice where only the rind of the orange is useful; the rest — the edible bulk of the orange — must be thrown away. Molly exists as a stack of flat nanostructures, like a pile of orange slices. These layers are not molecularly bolted together like a metal but instead are loose enough to slide over one another — a kind of grease, similar to the structure of graphene, and with huge internal surface areas. But here’s the rub: While the edges of these nanostructures match platinum in their ability to catalyze hydrogen, the relative immense surface area of their sliding interiors are useless because their molecular arrangements are different from their edges. Because of this excess baggage, a commercial catalyst would require a huge amount of molly. The slender edges would work hard like Cinderella, but the stepsister interiors would just hang out, doing nothing. “The extended test period made possible by the combined skills of our group allowed the reactions to be observed with the amount of detail needed,” said Chou. Kaehr cautions that what’s been established is a fundamental proof of principle, not an industrial process. “Water splitting is a challenging reaction. It can be poisoned, stopping the molly reaction after some time period. Then you can restart it with acid. There are many intricacies to be worked out.